There are approximately 31,000 calories in a gallon of gas, the fuel that most cars run on. Riding a bicycle on a flat road at about 15mph burns .049 calories per pound per minute. 912mpg is what a 175-pound person would burn on a 30-pound bicycle. Need One for each entry point into the Pedestrian Heart? Buy two, get one free!! Is cycling allowed in Darlington Pedestrian Heart? Heart at the blooard where Duke Street meets Skinnergate by a Community Support Officer. 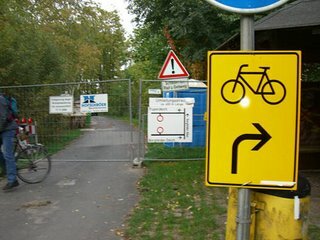 I was told that cyclng was not allowed in the pedestrian area and that I should walk my bike, or ride another way. When I questioned this, stating that there was a trial six month period during which cycling was allowed I was told that the council issued instructions that £30 tickets were given to anyone cycling in the pedestrian area, but that the officer would rather just ask people to dismount. Could you confirm whether cycling is allowed in the pedestrianised town centre? If it is, perhaps the police need informing of this fact? I have ridden through the pedestrian zone seven times this week without being stopped. cyclists can access Skinnergate from Duke Street at all times. cycle in line with existing signs and traffic orders. This email was also sent to everyone I had emailed. So, it seems that I was incorrectly stopped yesterday, since I was accessing Skinnergate from Duke Street. I have printed the email and will carry it with me on my way home tonight. I hope I am stopped. I will be replying to the email requesting that all police and SCOs are made aware of the rules regarding cycling in the town centre. Below is a video I took this morning of my ride to work. It’s a digital camera velcroed to the bars of the bike then stuck onto youTube, so please excuse the poor quality. I’ve also split the video into two parts.